For Novemeber 15, the Wordpress Daily Posts’s Daily Prompt is Tart. This post also uses the Daily Post’s prompt from November 10, so I’m adding that. That Daily Prompt was Vegetal. Both of these prompts work well to describe the second food experiment we did over the weekend. The first was the squash. 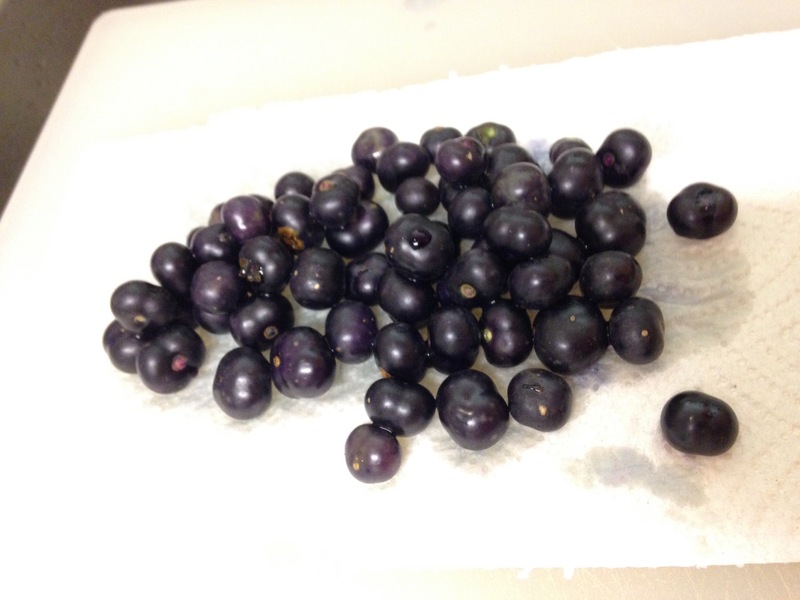 The next food experiment involved berries called Garden Huckleberries. If you’re familiar with regular huckleberries, then you might think, “oh, yum.” I’ve had true huckleberries in Montana, and they are similar to wild blueberries. Sweet and very yummy. The Garden Huckleberry is different. It’s a nightshade plant similar to tomatoes. I think I may have had some of these self-plant in flower pots a few years ago. Once I identified them as from the nightshade family and realized they weren’t tomatoes or peppers, I wasn’t really sure if they were edible, and I pulled them. They were probably safe if birds left the seeds behind (which is probably how the seeds got there), but I didn’t want to take any chances. 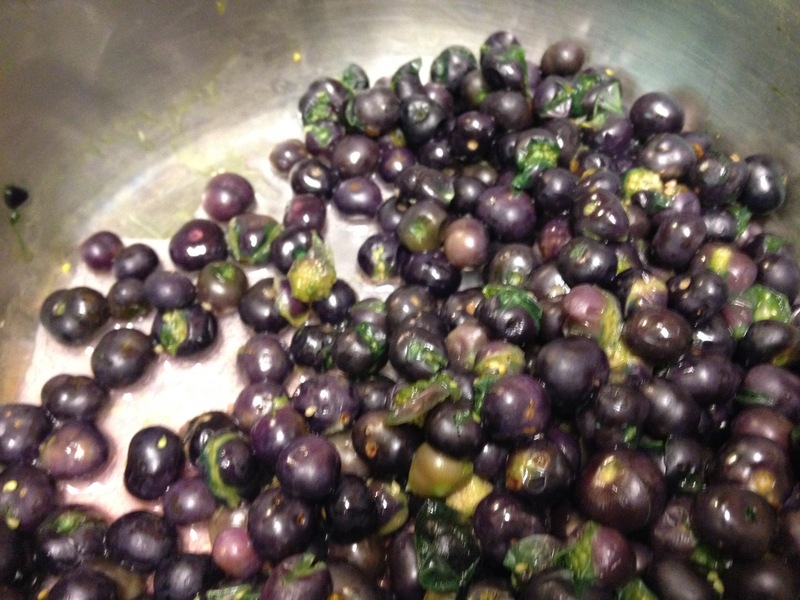 These Garden Huckleberries were grown by a farmer, and I purchased them at a farmers’ market. So I felt pretty confident that we could eat them. But they did come with special instructions, and I looked them up on the Internet at home. Garden Huckleberries must be cooked before they are eaten. They also need to be fully ripe (the green, unripe berries are toxic). Raw they taste a little like a green tomato, except I’d prefer green tomato to the taste of a raw Garden Huckleberry. They weren’t just tart or sour, but also bitter with a strong, unpleasant vegetal flavor. 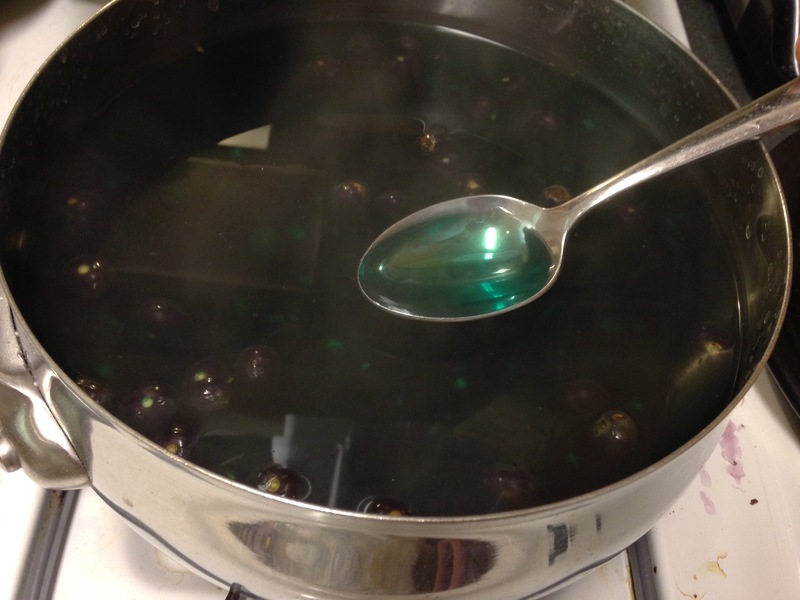 After removing the tenacious little stems from the Garden Huckleberries, we boiled them in enough water to cover and added a pinch of baking soda (per many instructions). Blueberries and red cabbage both contain pigments called anthocyanins that change color depending on the pH. It’s redder in acid and turns bluish-green or green in alkaline (basic) solutions. It can be fun for at-home science experiments and can even be used to dye Easter eggs. Garden Huckleberries have an abundance of anthocyanins. So we got a little surprise as the water with baking soda boiled away. Green foam began to form on top of the water. 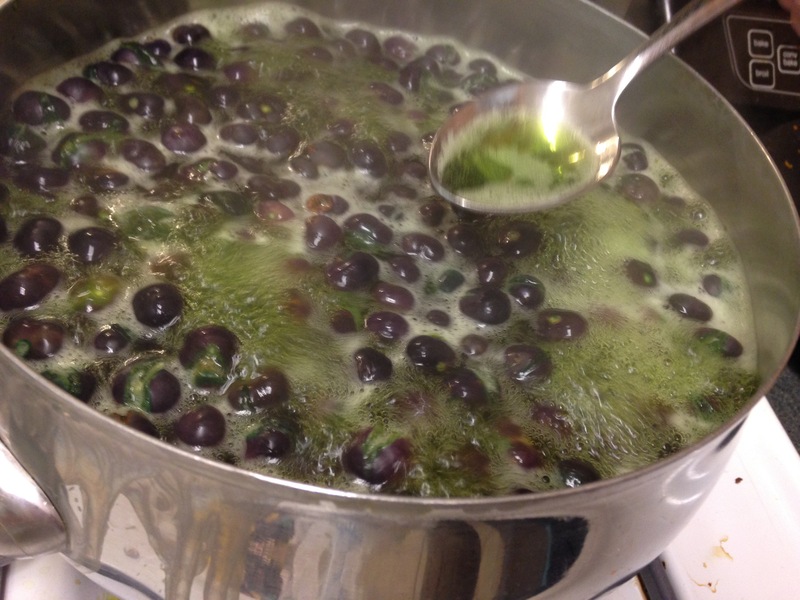 And as the berries continued to burst, dipping a spoon into the water showed us a vibrant blue-green water. As Halloween is not long gone, it felt like we were cooking up a strange and exotic witches brew that might be used for unsavory purposes. You might think I wouldn’t let that stuff anywhere near my mouth. Recipes for Garden Huckleberry all suggest adding lemon and sugar, so that’s what we did after straining out the creepy green water from boiling the berries. (And after doing a mini-science experiment before throwing all the fascinating water away.) 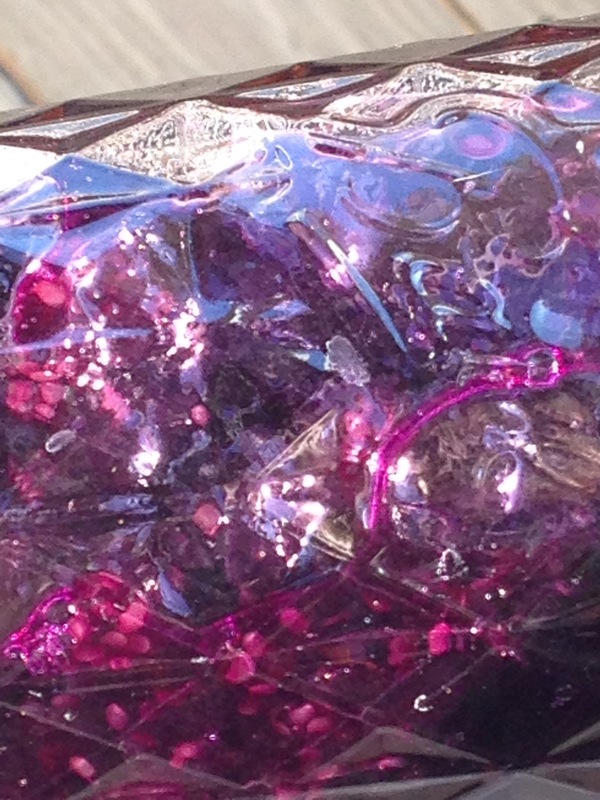 Red cabbage can be these same colors. I tasted the cooked berries before adding the lemon and sugar and was not impressed. They were still somewhat tart, bitter, and vegetal tasting but much less so than when uncooked. Now they had a hint of berry taste & aroma to them. So we were getting closer. 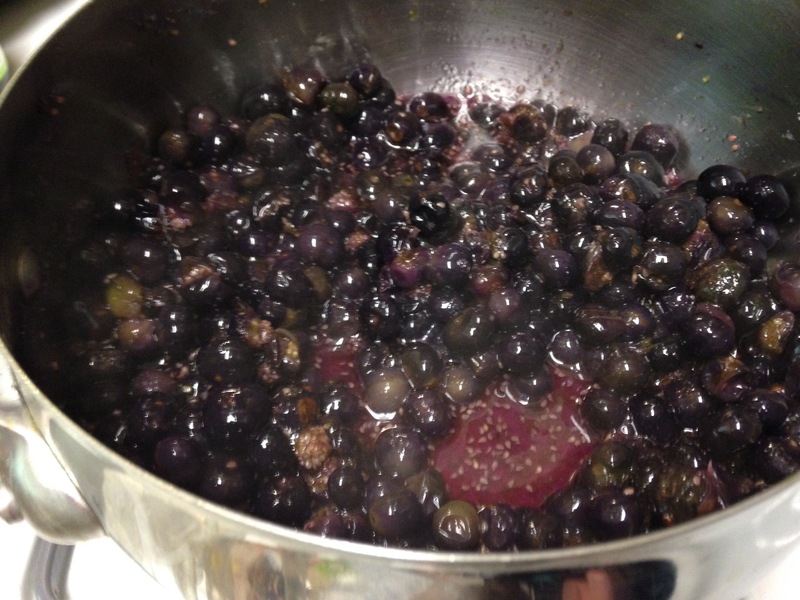 Garden Huckleberries parboiled with a little baking soda. Then we added the sugar and lemon juice and let them simmer away again. Adding the lemon juice turned all the greenish shades back to a reddish purple. The berries became a beautiful, deep, dark purple. Now when I tasted them, some of them were delicious and others were still a little off. I’m pretty sure the best tasting ones were the most ripe berries that had also burst very early in cooking. While the ones that weren’t as good were either less ripe or didn’t burst (or both). Regardless, I decided to add more lemon juice and sugar and simmer longer. The end result was fairly close to a fruit preserve or pie filling. It tasted a little like blueberries, but also had its own sweet & slightly tart berry flavor. The longer we cooked with lemon and sugar the better they got. It wasn’t just covering up the weird taste. The end result didn’t taste like lemon really. But I think the combination of lemon juice and sugar transforms some component in these berries, so that the flavor actually changes. 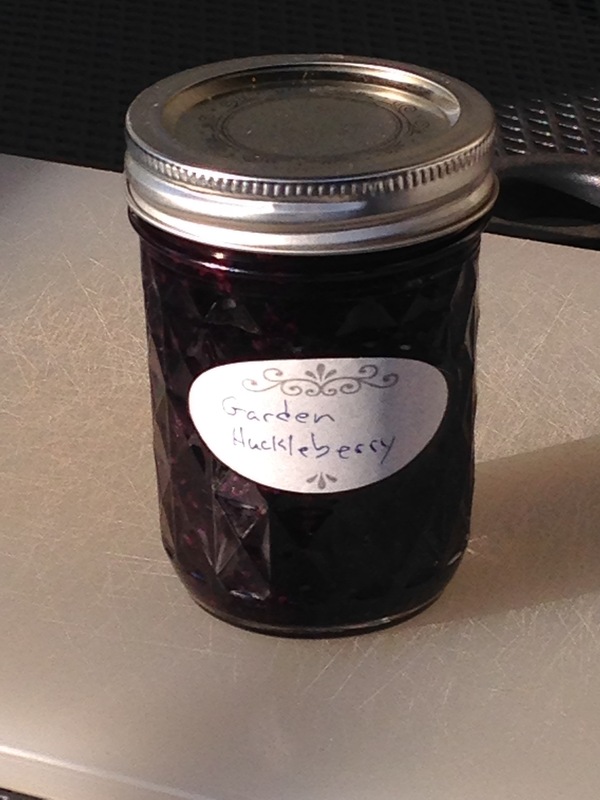 So Garden Huckleberries were good. We put the goop in jars. I may add some to a pie or fruit tart. I’m not 100% sure if I’ll get them again. I like berries that I can eat raw. But these were fun to try and the colors (all of them) were pretty amazing.